A recyclables container dropped off on October 30, 2014, at a Stamford refuse transfer station contained 2 skulls, a jawbone, and thousands of books, magazines, and videos about the occult. The items came from the house of Robert L. DeVitto, who died at the age of 56 on October 15. Junkluggers employees thought the skulls were plastic and considered placing them on the truck as a Halloween decoration. Instead, they left the skulls in a container. The skulls drew a lot of attention. Police are now investigating. Among the debris were thousands of witchcraft books and videos about Satanism. Early reports indicate the skulls came from an elderly man and elderly woman. What remains to be known is whether the DeVitto purchased the skulls online or acquired them illegally. The skulls have been sent to an anthropologist for analysis and to determine provenance—basically that nothing too sinister occurred. Initially the police had not contacted DeVitto’s family, nor did they release the name of the man. Since then, the deceased man’s 89-year-old father stated that his son led a troubled life and was beset by personal demons. 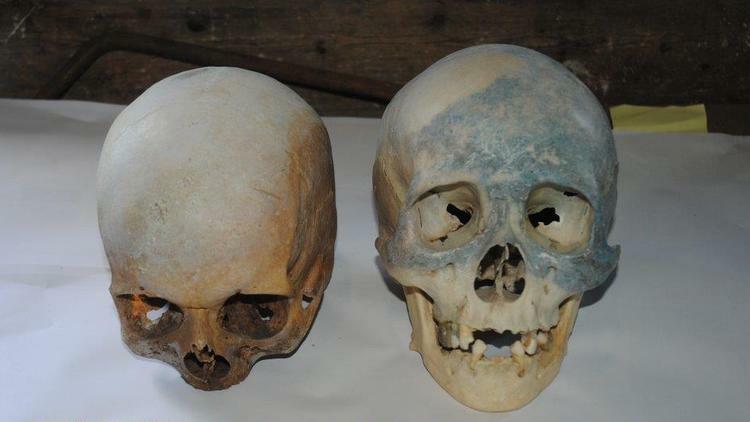 A Connecticut family has come forward stating that the skulls may be their dead grandparents whose mausoleum was disturbed a decade ago and skulls were stolen. Robert DeVitto, Sr., the dead man’s father, stated that his son purchased the skulls online for $1,000. “He liked weird stuff like that,” said DeVitto. Testing continues with the results expected in a few weeks.